1984 Cordova High School Graduate Barbara was a long-time teacher in Santa Cruz and a very active member in her community. 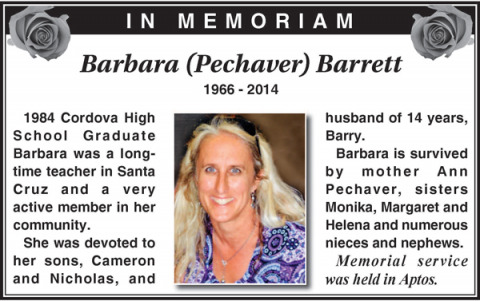 She was devoted to her sons, Cameron and Nicholas, and husband of 14 years, Barry. Barbara is survived by mother Ann Pechaver, sisters Monika, Margaret and Helena and numerous nieces and nephews. Memorial service was held in Aptos.